Landscapes are formed by the various combinations of tectonic forces, weathering, erosion, and deposition. Plate tectonics are driven by gravity and the Earth’s heat. Heat from the Earth’s interior escapes through convection just like the convection you see in a pot of boiling water or in a lava lamp, only much m-u-c-h slower. Cold, dense rock from the surface of the earth sinks down and hot, buoyant rock from the center of the earth rises up; this is driven by gravity. Here is an Exploring Earth convection animation to illustrate the process. Doable Demo: Watch a lava lamp and describe what you observe. Do the wax blobs move uniformly? Do they move at the same rate all the time, or is there a difference as the lamp heats up? Why? Convection causes the lithospheric plates that make up the top 5 to 40km of the earth move around and bump into each other. Have a look at this Exploring Earth animation of plate interactions. Doable Demo: Make ‘plates’ out of cardboard, modeling clay, pieces of bread, graham crackers or other plate-like object. Move the plates around without lifting them off the table (though some plate edges might slide under or over other plate edges). What are the different ways the plates move past each other? What happens to the plates as they move around? 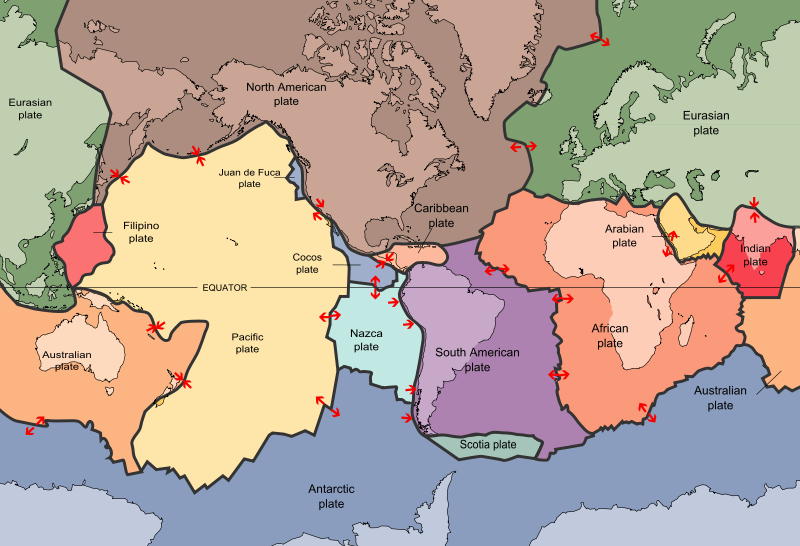 Plates crashing into each other and sliding past each other cause much of the geological excitement that happens on earth, such as earthquakes, volcanic eruptions, and mountain building. Next we will view some typical landscapes controlled by different types of tectonic forces.